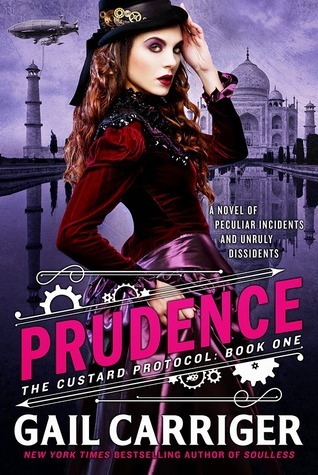 I just finished Gail Carriger’s latest, Prudence. This is book one of the Custard Protocol series, which I assume will be a 4-5 book series like the Parasol Protectorate books and the Finishing School series. Because this is a very new novel, I won’t go into much detail here. All three series are interlinked, so it’s really fun to see where things come from or go. This book follows Lady Prudence Akeldama, the adopted daughter of Lord Akeldama, rove vampire extraordinaire and biological daughter of Lord and Lady Maccon. She’s out in society, so probably about 18-19. Her best friend Primrose is the daughter of her mother’s best friend, Ivy Tunstall and she clearly has some sort of feeling for Madame LeFoux’s son Quesnel. This book follows the adventures of Prudence (called Rue) and her friends to India via the improbably ladybug colored dirigible, The Spotted Custard. This is a present from Lord Akeldama to Rue with the express intent of getting her out of London due to an unfortunate werewolf in bloomers incident at a society party and to get her to do some covert tea buying. This is clearly the introductory story of her next story arc. There’s a lot of character building but I can’t quite decide of I’m supposed to like any of these character, particularly Rue. I feel she’s a bit spoiled and I can’t help but feel that I really, really want her taken down a serious peg or two. There’s clearly supposed to be some sort of romantic build up between Rue and Quesnel, but…I just can’t seem to care. I think that’s far too tidy, considering Quesenl’s mother was in love with Rue’s mother. I don’t particularly like that Lady Alexia Maccon seems to have turned into every disapproving mother ever. She didn’t seem like that when Rue was little in the last Parasol Protectorate book.